Rick Bragg is the author of eight books, including the best-selling Ava’s Man and All Over but the Shoutin’. He is also a regular contributor to Garden & Gun magazine. He lives in Alabama. This book is a tribute, a monument, to his mother and her people, captured here in solid recipes for good food... All the stories in this book... gleam with a special luster; they’ve been polished by time, and no one is meant to get hung up on the details." "A beautifully written memoir... For readers who crave soul with their recipes this is a fitting tribute to foodways that are fast escaping." 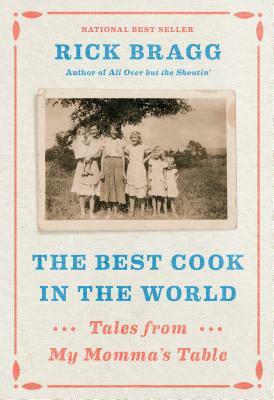 "Bragg’s entertaining memoir is a testament that cooking and food still bind culture together." "Heartfelt, often hilarious stories from an Alabama kitchen, a place from which issue wondrous remembrances and wondrous foods alike...Affectionate, funny, and beautifully written: a book for every fan of real food." "His prose evokes the sights, sounds, and smells of a rural Alabama kitchen and transforms apparent poverty into soul-satisfying plenty." "Marvelous... uproarious...These stories shimmer and shine, casting a Southern spell with Bragg’s gorgeous prose... The Best Cook in the World is Julia Child by way of the Hatfields and McCoys. Margaret Bragg can cook up a storm, while Rick Bragg writes with a powerful, page-turning punch. The result is unimaginably delectable." "Rick Bragg serves up a feast of love... [A] love song to the woman who raised him and who has been his greatest muse." "Bragg is a soulful storyteller, a reporter with a poet’s eye, and an appreciative diner. Most of all – here, as with earlier family memoirs – he’s a ferociously devoted son... Bragg has a bone-deep empathy for people who endure hard times, and leverages that understanding to share even second-hand stories." "If you let it work its culinary magic, The Best Cook in the World will probably transport you to Alabama...New York, L.A., San Francisco, and Parisian gourmets and gourmands will find a lot to enjoy in The Best Cook in the World. They may want to surrender their beloved palates at least for a meal or two and savor Rich Bragg’s amazing culinary world." "Readers of this book will learn about Bragg’s mother’s kitchen, of course, but also about what makes food good, and what role food can play in a family and in a culture. Just thinking about this book is making us hungry." "The beloved author of All Over but the Shoutin’ has written a loving tribute to his mother, the South, stories, tradition, and a disappearing way of life."